I generally don’t say much on CitizenWill about Federal officeholders but since there’s been a lot of blather about Elaine Marshall’s chances of overcoming Richard Burr I thought I would submit one way she can challenge Burr’s reputation of supporting our troops. Elaine, as part of her Senate campaign, started a petition calling on Burr to support a Consumer Finance Protection Agency. Burr, so far, and his Republican colleagues have been less than supportive (to put it mildly) of the initiative. ranking Republican on the Senate banking committee on Monday [June 21st, 2010] told a group of N.C. bankers that a proposed consumer financial protection agency is the “worst” part of an industry overhaul making its way through Congress. Senator Shelby, after Wall St. gamblers pissed billions of investor dollars down the drain, threw the economy into a historic tailspin and bamboozled American citizens into picking up the tab, I can well imagine having more oversight. For instance, “visualizing” restoration of the kind of protections we once enjoyed under the Glass-Steagall Act. Shelby was visiting the Old North State “at a breakfast fundraiser for Burr attended by about 70 bankers”. What does the Consumer Finance Protection Agency have to do with our military families? That letter of endorsement starts by highlighting the effects predatory and unscrupulous lending practices by some automobile dealers have on our military families. So what are the problems in the auto lending world? Here are some. I’m guessing I’ll learn of some new ones in the comments. I’m also guessing that auto leasing has its own bag of tricks. Bait and Switch. There are lots of variations on bait-and-switch with auto dealers. Here’s one: the dealer gives the consumer a quote on a particular model and says that it is in stock. The consumer comes in and guess what–that model is still in stock, but only with a bunch of dealer-added features (hubcap locks, pinstripe, fog lights, etc.) that raise the cost of the car by more than the value given. Want to guess why I’m driving a Honda Odyssey with a “racing pinstripe” on it? Hidden Fees. This is sort of self-explanatory, and is another bait-and-switch variation. The consumer bargains with the dealer over the price of the car and the financing and thinks that a deal has been reached. Then the consumer gets the final bill for the car and it has a bunch of previously unmentioned fees. The dealer says don’t worry, we’ll just increase the amount financed. Loan packing. Overpriced and underused or frankly unnecessary products like credit life insurance and GAP insurance and rust-proofing get bundled in to the deal. Overselling. Dealer’s cuts on loans can give them an incentive to steer consumers into larger loans. One way to do that is to sell the consumer a more expensive car, which requires more financing. Of course the consumer still has to be qualified for the loan, and there have been problems in auto lending, just as with mortgages, of dealers (and borrowers) fudging the numbers on the paperwork to make borrowers look more creditworthy. Spot delivery yo-yos. This is one of the sleaziest moves. The consumer buys a car with financing arranged through the dealer. The financing includes a nonrefundable deposit. The consumer takes the car home thinking that everything is in order. The dealer then calls the consumer the next day to say that the financing was denied in the end and the consumer has to return the car. And the dealer keeps the deposit. Binding mandatory arbitration. This is a generic consumer finance problem. Such practices are familiar to folks who live in North Carolina’s host communities. Unfortunately, the protections DoD asked for have been gutted by both Republican and Democratic (BOO!) House members. Elaine can differentiate her candidacy not only from Burr’s but of her own Party by coming out strongly for specific remedies to this loophole. Local chef and stalwart activist Vimala Rajendran (Indy profile) opened her new Curryblossom Cafe today. Though Ellie, Elijah and I were her 13th customers, our luck was far from bad. Not a big surprise for anyone who has tasted Vimala’s take-home menu. By 5:30pm the small restaurant was bustling with activity. The kitchen was full, the dining room was full – folks were spilling out into the courtyard. I had the BBQ with plantains and both Ellie and Elijah had the Chicken Thali. All around an excellent meal. Vimala’s is located at the Courtyard [MAP] in the old SandWhich location. [UPDATE:] Ellie, at 3:00pm, was #143. Analysis of turnout is coming in but it’s clear Elaine has won with apparently 2/3rds of the vote. Just back from the Library. I was #112 in one of the voting-est precincts in Town. Given the early voting trend this year, that doesn’t bode well for overall turnout. In a funny coincidence, I was talking with one of the long term poll workers about how crazy mad my Mount Bolus neighbors are to vote when Judy B., who lives down the lane, dropped by to be #113. I’m proud to live in a neighborhood that so consistently turns out to vote. I’ve voted, with the exception of one 2nd primary, every election from 1980 on. I heard it suggested by some folks that those who wanted to keep their voting streak alive but didn’t like Cal or Elaine drop a blank ballot in the box (I’m talking about you G-man!). I believe that you can always make an affirmative choice, that not to do so doesn’t help move our democracy forward, and so I cast my vote today. A quick update on yesterday’s report (“Radical Shift In Vision For Downtown”) about the Downtown Development Framework and Action Plan charrette. First, the Downtown Partnership has posted the DRAFT Downtown Development Framework Presentation here [PDF:14M]. The Town’s webserver had a little trouble downloading it so I’ve also put a copy here. The presentation made by Kling-Stubbins fleshed out a bit more of the proposal and added additional context, so what you see here is not the whole story. I was pleased to see a wide range of comments I heard during last April’s forums make it into yesterday’s presentation. I was also pleasantly surprised to see how many of the specific comments I made were reflected in the draft. For instance, noting “Wallace deck provides no active street edge on East Rosemary” (and creating a commercial component along that edge and other potential decks should be a design recommendation) and that defining the “edges of Downtown” along with creating a better “transition to residential neighborhoods” should be an integral priority. Beyond that, they also captured my concern that the Town isn’t addressing the issue of “downtown/higher density … creeping up MLK”. I had echoed a common, but understandable, complaint from both the development and wider community that the Town’s “redevelopment review is too subjective” (you might recall my underlining Council member Ed Harrison’s comment that the development special use permitting process was a “crap shoot” during last year’s election). Further, they specifically quoted my comment that Downtown should be partially “about culture, not just commerce” (though Kling-Stubbins omitted my elaboration that Downtown is a common asset of and for the whole community). Of course many folks share common concerns, like bolstering a “more visible Police presence” Downtown and have made similar suggestions. A lot of this ground has been tread over before. As far as commercial development, Kling-Stubbins didn’t mention my call for affordable commercial/office space but did mention my suggestion we should encourage creation of commercial “incubators”. They also referenced my concern that our current leadership has “a perception that nobody works downtown” (I did for over 8 years and well understand that blindspot that used to plague policy creation). Unfortunately, staff and the consultancy omitted the Town’s municipal fiber network infrastructure as a key Downtown economic development resource. “Why don’t residents frequent Franklin St.?” is one question I’ve heard over and over through this and many other Downtown policy discussions. Solving that riddle, not just relying on attempts to increase the number of high-roller residents, is the real key to Downtown’s success. Downtown shouldn’t be all work and no play. It was great that several folks brought up the use of UNC’s “McCorkle Place for concerts and public events”. Sadly, the University just indicated that using McCorkle for public gatherings, a common practice a few decades ago, is untenable. Big events there pose a serious environmental threat to the grand old trees spread throughout that University commons. A plank of my election campaigns going back to 2005, addressing the need for “more family oriented public spaces”,”fountains [I meant drinking]” and “pocket parks” Downtown also made the grade. The consultants also picked up on the idea of siting both a “library”, which the Chamber’s Aaron Nelson help flog last year and Commissioner Barry Jacobs promoted this, and a “middle school downtown” (I had observed that the old University Chrysler building was larger than my elementary school and suggested it might be converted). It wouldn’t be Chapel Hill without some discussion of transit. “Increasing night time bus service” and creating more direct routes to Downtown from Hwy. 54 and 15-501 , both comments I frequently heard (and made myself) at the two previous forums, led to some more involved discussion during the informal Q & A session following the presentation. In terms of a comprehensive facility for managing multiple modes of transport, Kling-Stubbins used a design example for the proposed transit center (lining the new street occupying the eastern margin of Lot $5) that was architecturally like Durham’s new facility (which I covered last year Multi-Modal Design I Appreciate). Again, the consultants manage to catch some of the best ideas from last April including riffing on improved transportation linkages and walkability throughout Downtown. 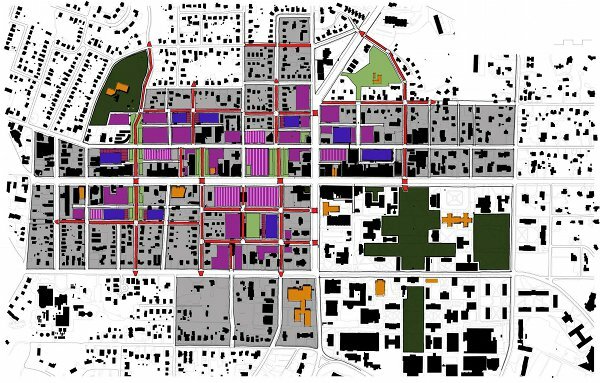 I really liked that Kling-Stubbins was willing to challenge the general view that Downtown only needs a series of tweaks by sketching out a new system of pedestrian and bike friendly roads – real linkages – in central Chapel Hill. A revolutionary approach I hope will shake up some of our more uncompromising conceptions of Downtown. That said, while “high concept” can be enlightening, there are a series of very practical, pragmatic and cost-effective tweaks that were missing from the proposal. One example, dealing with the grease depository behind Franklin Street’s 100 block. Fixing cracked or handicap inaccessible sidewalks were among others not even acknowledged. One practical solution that wasn’t omitted, improved signage. Specifically, creating directories of downtown services and posting them throughout the central district between Franklin St./Rosemary St. (in Planning parlance “way signage”). This is an idea I’ve lobbied for since my run in 2005 (and again as a member of the Downtown Parking Task Force). A bit further afield, Council member Laurin Easthom’s call for another Downtown trolley along with a suggestion made by several folks to convert the intersection of Columbia/Franklin St. into a “scramble” zone (red lights both directions, free-for-all getting across). Many of the concerns and suggestions I heard during the (now defunct) Sustainability Visioning Task Force’s forums last year also arose during both last April’s initial and yesterday’s Action Plan public outreach. There was also quite a bit of overlap with comments made during the University Square redevelopment forums, the Campus-to-Campus Bike Connector discussions, the recent Police outreach effort and quite a few other public events sponsored by the Town or University in the last few years. Unfortunately it appears that the Town hasn’t provided Kling-Stubbins that citizen input and, at least at this time, there is no plan to integrate the concerns/suggestions voiced during these different events in crafting the new Downtown action plan. Seems like another waste of citizens’ valuable efforts to influence our Town’s direction. A bit discouraging. That high flying rhetoric looks good on a chart but the emphasis on “delivering customers” and the use of “green” is a bit troubling. What happened to the idea that Downtown, which all of us are invested in, is a community asset – a commons for culture, commerce and community to meet in? The faux “downtown” at Durham’s Southpoint might be designed to lure customers, Chapel Hill’s Downtown needs to be designed to lure community. Without a sincere and concrete commitment to make measurable and enforceable “green” goals a part of the framework (something the Council wasn’t willing to do with their own Lot $5 project), this rhetoric amounts to little more than “green washing” – a PR tactic we’ve seen used to promote some fairly substandard projects throughout Town. Of course, this is just the first draft of the first steps proposed. Both the consultants and our Town staff – Economic Officer Dwight Bassett and Downtown Partnership’s Jim Norton – agree that much more resident review is needed to hammer out the final plan. More analysis and commentary on the revolutionary new layout for Downtown, the troubling suggestion of financing improvements using TIFs (tax incremental funding), the reliance on the recent flawed parking study and interesting examples of the consultants misreading of Chapel Hill’s character coming soon. Happy Birthday to WCHL’s Ron Stutts! Ron, besides being the bedrock upon which WCHL’s success rests, is an all-around “nice guy” (hope that doesn’t mess with his street cred ;-)). I met Ron a longtime ago but didn’t really get to know him until I became more active in the local community. Ron seems to know everyone, has an encyclopedic knowledge of our community, is a stalwart supporter of many worthy local causes, has a great mellow vibe and is just an interesting guy to shoot the breeze with. One of Ron’s many jobs at WCHL is to corral community commentators for WCHL’s 90-second commentary spots. While I had done a few sporadic commentaries on critical issues like the red-light camera project, saving Chapel Hill’s only hands-on arts program, the Town’s budget, Lot $$$5, etc. over the last decade, I hadn’t thought of myself as up to being a “regular” like Walt Mack, Terri Tyson, Augustus Cho, Wes Hare, Laura Paolicelli or Fred Black (who now appears to have a regular gig subbing for DG Martin on WCHL). I ran into Ron at a community event shortly after last year’s election and he kindly encouraged me to comment on a more regular basis.I’m pretty sure he didn’t know what he was letting himself in for as I’m fairly sure each of my spots takes some skillful editing to squeeze them into their allotted time. Ron always pulls off that feat with the best of humor and makes what sounds like an incoherent delivery into a fairly serviceable message. Thanks Ron for giving me the opportunity to get the message out. Ron is always looking for new commentators, here’s his contact info if you’re interested. Orange County Sales Tax:You Want To Increase Our Tax Burden Now? Final bit of business from this evening’s Orange County Board of Commissioner’s meeting. A couple weeks ago, members of the Council, Commissioners, our Town and County managers, met to discuss increasing the County’s financial contribution to Chapel Hill’s Library. As of today, the County’s current yearly $250K contribution is out-of-line with out-of-town usage. In effect, Chapel Hill subsidizes, and has subsidized by as much as $6M over the last decade, County residents use of our facilities. If Chapel Hill elects to expand the Library (which it seems at this point Council will do irrespective of fiscal prudence), that subsidy will swell. Now, it isn’t the County’s fault that Chapel Hill’s Council wants to take on another $1.3M in yearly operational costs (and another $2.3M in yearly bond payments) during the worse economic downturn since the Great Depression but they did commit to answering Council’s pleas for more bucks. Tonight the County Manager proposed [PDF] to raise the contribution to $500,000 or %50 of Hillsborough’s main library budget (which services Hillsborough and beyond). The increase to $500,000 would be graduated over time and level out. This is below the initial $700K figure thrown out a few weeks ago and well below the $1.1 million ( of an eventual $2 million OC library services budget) Chapel Hill calculates as the County’s “fair share” of support necessary after the expansion. FYI, Orange County’s current library services budget – which was reduced by $162,000 in all areas EXCEPT for Chapel Hill’s $250,000 stipend – is now down to $1.2 million. In other words, while the County’s budget for services outside of Chapel Hill dropped %11.7, Chapel Hill’s, as a percentage of the available funds, increased from %18.1 to %20 – a rare increase in this year’s County budget [PDF]. Note: Southwest branch refers to a proposed new facility serving Carrboro and points west. Barry Jacobs suggested opening branch at the County’s Skill Development Center on West Franklin St.